For over 120 years Marshalls has been helping homeowners across the UK to design and create beautiful, practical, outdoor spaces to enhance their homes. We give you the largest choice of proven quality paving products and accessories in the UK, ready to order online for delivery or to collect from our stockists. Marshalls can also help you find reliable paving or driveway installers using our unique Register of Accredited Installers. Slatewood is an excellent choice for exterior flooring or paving, garden steps, retaining walls and of course many other uses including borders. As a cladding option, its spectacularly grained faces are unique, which other product has the beauty of old timber yet is an ultra durable natural stone? Its very high flexural /bending strength makes Slatewood ideal for retaining walls and raised beds. 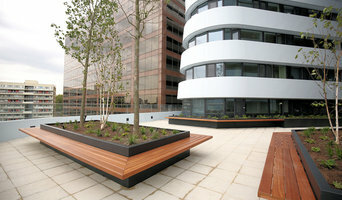 Why Slatewood and not timber sleepers or concrete or sandstone or even limestone ? Slatewood will not rot or burn. It is a well known fact that most if not all the reclaimed railway sleepers are contaminated with carcenogenic creosotes, oils and so on. Timber will be very slippery when wet or covered in algae, lichens or moss; safety should be a prime consideration when deciding which products to use in your home or garden. Slatewood has the highest rating for grip, currently this is over 70SRV in the dry and 55SRV in the wet, no other material currently being used in landscaping is comparable overall ( including flamed granites which tend to have the highest ratings of natural stone ) Compared to concrete, sandstone, limestone and many other materials, Slatewood has various distinct advantages, firstly the water absorption ( 0.02% ) is far, far lower than any of the afore mentioned and as a result Slatewood will not absorb algae and lichens as is the case with the majority if not all the other materials. Flexural resistance ( bending strength ) is important for paving, steps and retaining walls, in this field Slatewood also proves to be excellent, with rating of over 60Mpa and 50Mpa after 48 cycles this is considerably higher than the competition with the exception of timber. 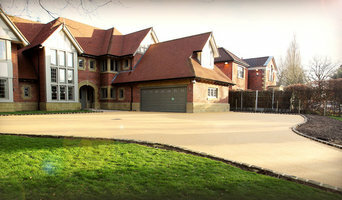 PJC Driveways home improvements are a family run business having 25 years experience specialising in all types of driveways consisting of hard landscaping, driveways patios, power cleaning and sealing, garden services, garden walls, paving, patios, fencing by using finest materials and latest technology and offers a no hassle prompt service with speed of delivery. Rope Source are one of the UK’s leading rope suppliers. From decking ropes to clothes lines, we stock a huge range of both synthetic and natural ropes. Our polyhemp, sisal and manila ropes are perfect for use with garden decking and our polypropylene ropes are widely used in agricultural, industrial, leisure and transport applications. We also have a wide range of coloured cotton ropes, magician’s ropes and decorative braids, and we stock a selection of quality marine and yacht ropes. Fat Grass was set up by Katherine Watson, a qualified garden designer and horticulturalist with over ten years of experience in designing and building gardens in and around the Greater Manchester area. From the design to the build of your garden, Fat Grass is committed to providing a beautifully designed garden that reflects your practical needs and individual style. We are passionate about all areas of garden design and development and with Fat Grass you will get an excellent knowledge of contemporary ideas in the design field, in-depth planting knowledge and an honest assessment of what you can achieve within your budget. We have designed gardens of all sizes from small courtyard city gardens to large suburban gardens and we have had many people returning to us for further design work when they move to a new property. Please visit our testimonial page to see what clients have said about us We are passionate about what we do and our goal is to give you a garden that you will enjoy and develop for many years to come. Since 2004 Pictorial Meadows has been part owned by the University of Sheffield and the environmental social enterprise, Green Estate. Far more than just a seed supplier, the company is unique in being made up of experienced landscape architects, researchers, horticulturalists and landscape managers. This allows us to not only offer you the very best and newest meadow products on the market, but provide the specialist design, establishment and maintenance skills to see them flourish! SpiroGlass By Jo Cuffley. Unique Stained Glass Garden Art. Our contemporary designs are based on the Spirograph concept. Nomow are one of Europe’s market leading manufacturers and installers of artificial grass for gardens, schools, nurseries, safety surfaces, and golf courses suitable for all types of gardens and play areas; providing an all weather play surfaces. As a leading gardening company in Stockport and Greater Manchester. Our team members are fully qualified, experienced, and use only organic materials. Call us 24/7 and get a free quote. We are leading gardening services provider in Manchester and we offer a wide range of lawn and landscape services in the area. Our technicians are fully certified, licensed, and always strive to deliver the perfect garden for you. Brandon's gardeners is a company which provide professional gardening care in Warrington. The company have many years in the gardening services field. What garden supplies can I get from New Mills, Derbyshire garden centres and landscaping retailers? If you’re going for a complete overhaul of your garden, then you’ll probably need soil, turf, large plants, trees, decking or patio materials to make a start. Wholesale garden suppliers in New Mills, Derbyshire will be your best option for all the basic garden supplies, so get in touch with them to discuss your needs. Once you have the foundations of your garden sorted, then the adorning and decorating can start, which is where New Mills, Derbyshire garden centres will become your new favourite haunt. From seeds, small plants, garden ornaments and plant pots to the bigger structures such as pergolas, greenhouses, garden furniture, water features and planters, garden centres will offer a wonderful range of garden supplies and accessories to help you lade your garden with lovelies. Find specialistNew Mills, Derbyshire garden suppliers if you’d like more uncommon garden features, like fire pits, garden sculptures, raised flower beds or special garden lighting. You can even find vintage garden accessories from some retailers if you want the shabby chic, eclectic garden look. Garden suppliers and landscape supply professionals in New Mills, Derbyshire will be able to offer advice on the suitability of certain products for your garden design and possibly assist with the installation and maintenance of your garden supplies and features. You may wish to involve a garden contractor or landscaper in your garden supply choices, as they will also have a clear idea of what materials and items are best. 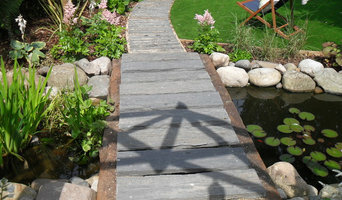 They may also be able to recommend New Mills, Derbyshire garden centres in your area that they have worked with before. Here are some related professionals and vendors to complement the work of garden & landscape supplies: Landscape Contractors, Main Contractors, Landscape Architects & Garden Designers. What landscaping and garden supplies do you offer? Do you manufacture your own garden accessories, furniture and ornaments? Can you deliver or install your garden supplies? Can you offer advice on looking after plants you sell? What type of fertilisers do you sell? Which do you recommend? Find landscape and garden supplies on Houzz. Search the Houzz Professionals section for New Mills, Derbyshire garden centres and garden suppliers. Browse photos and read reviews. You can also explore full-service New Mills, Derbyshire landscape architects and garden contractors.